The Armeni Village is located on a pedestrian street in the center of Oia, in the vicinity of Caldera. 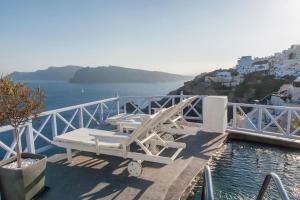 The pool and outdoor hot tub area offer wonderful views of the sea and caldera. 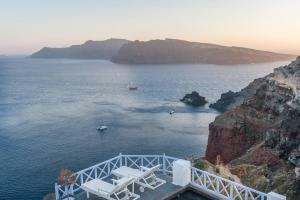 The property offers a round-trip shuttle service to the port and airport of Santorini at an additional cost. Guests interested in this service must inform the property in advance. Contact details can be found in the booking confirmation. Open-plan bedroom with double bed, bathroom with shower and veranda with magnificent views of the Caldera and the Aegean Sea. The room is equipped with air conditioning, safe, LCD satellite TV, minibar, coffee maker, hairdryer, internet connection, bathrobes, slippers and luxury toiletries. 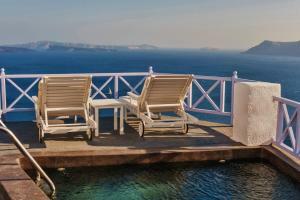 It consists of 1 master bedroom, living room with 2 work sofas and a porch or balcony with magnificent views of the caldera and the Aegean Sea. This room type has a maximum capacity of 4 people, upon request and at an additional cost. Open-plan bedroom, with a comfortable double bed and a private balcony with magnificent views of the caldera and the Aegean Sea. This suite features an outdoor hot tub with views of the caldera and the volcano, 1 large double bed, bathroom with shower and balcony. 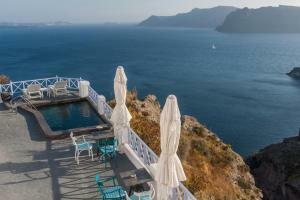 next articleHow is the weather and temperature on the island of Santorini?